Wahroonga Park is located along Coonabarra Road in Wahroonga. This popular playground was renovated and reopened in September 2016 and a new toilet facility was completed in July 2017. 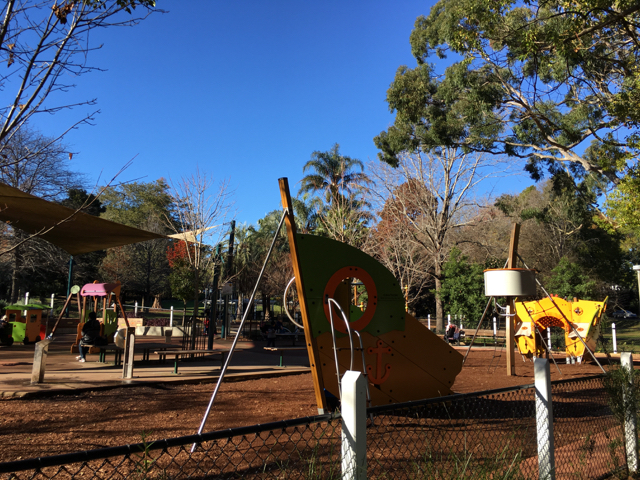 The main feature of this playground is a cute train with carriages as the playground is close to Wahroonga train station. Little Mister was enjoying on our visit, he loved going into the front of the train and going through the tube as well as sitting in the carriages pretending we were on the train tracks. 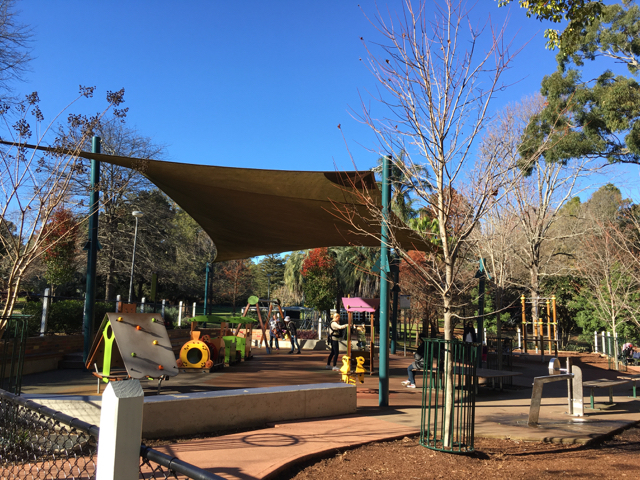 The playground is nicely shaded with a large shade cloth covering the train, a small climbing cubby, bouncers, a child and baby swing, a small slide structure, a roundabout and a climbing structure with flying fox. Little Mister loved the train platform area with built-in bells, great for stepping on to make music. He also liked loved walking along the ledge nearby following the other children. We also love that the playground floor is soft fall rubber which makes it safer for little ones. The other area of the playground is shaded by trees and has a medium structure where kids can play hide and seek and climb on top of as well as another climbing structure where they can admire the playground from high ground like a pirate! The mulch soft fall side of the playground also has a larger structure which represents half of a boat where older kids can climb and slide down. The playground is full fenced and has a number of seating areas where you can sit and enjoy a coffee from nearby café. Bring some snacks and drinks for the little ones. There is more seating and picnic tables outside of the playground which has a number of different swings such as a lounge chair swing, a large 360° birds nest swing and a baby and child swing. The nearby recent refurbished toilet facility with a family friendly cubicle is steps from the playground which is ideal too. There is also nearby free parking along Coonabarra Road.